Happy Wednesday! 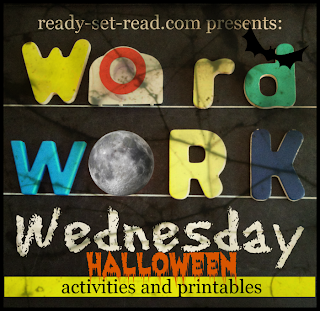 Each Wednesday on Ready-Set-Read is Word Work Wednesday. This week, word work Wednesday is taking a not so spooky Halloween twist on vocabulary development. A preschool child's vocabulary is one of the strongest predictors of future reading success. Word work time is a great time to work on vocabulary as well. I am featuring my Halloween vocabulary activity on a G+ Hangout on Air this morning at 8:30 CST. There will be several other fun Halloween activities shared as well. If you can't check it out live, you'll be able to watch the video right here on ready-set-read. You can find more examples of word work on my Word Study Pinterest board. I'd love if you'd follow while you are there! Disclosure: I was provided a free Halloween TOOB from Safari LTD to complete this activity. What a great collection! I will have to try out the activities to did with them.